NIA CHARLESTOWN NEVIS (March 02, 2018) — Special Envoy of the President of Indonesia His Excellency Muhammad Lutfi paid a courtesy call on Hon. 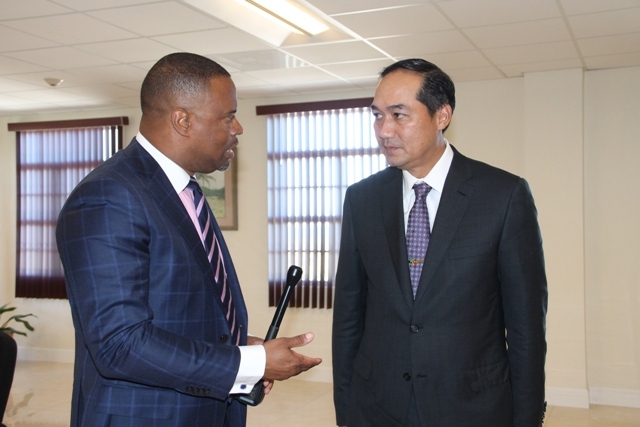 Mark Brantley, Minister of Foreign Affairs in St. Kitts and Nevis and Premier of Nevis, at the Premier’s office at Pinney’s Estate on March 02, 2018, in a bid to deepen relations with the Federation. Mr. Lutfi, who is visiting St. Kitts and Nevis for the first time, noted that Indonesia has a lot of initiatives in place in order to fight the same issues that St. Kitts and Nevis has like climate change. “This is something that we have to fight together and with that I would like to deepen our engagement and hopefully that we can create prosperity for the world and also peace that we are searching for,” he said. Mr. Brantley welcomed Mr. Lufti and registered gratitude for the developing relationship they forged. The Minister pledged the Federation’s continued support to the relationship and continued close working relations with Indonesia. He pointed to the benefits St. Kitts and Nevis has had since establishing diplomatic relations. “Indonesia is a major country and just last year we were able to sign visa waiver arrangements…. “I am very pleased and I extended our thanks to His Excellency for the Batik workshops that were arranged here last year in St. Kitts and in Nevis and for the very kind offer of a Batik scholarship which will see an individual from here going to Indonesia for a year to learn all the intricacies of Batik,” he said. Mr. Brantley also stated that the offer of a scholarship to study Batik for one year in Indonesia is an opportunity particularly for single women to develop a cottage industry. Indonesia is world-renowned for its tourism and hospitality, its Batik and destinations such as Bali. Also present were His Excellency Priyo Iswanto Ambassador of the Republic of Indonesia to St. Kitts and Nevis and members of staff from the Ministry of Foreign Affairs of Indonesia.